MOTOROLA ने हाल ही अपना ANDROID ONE आधारित SMARTPHONE MOTOROLA One Power International Forum पर पेश किया था। यह Phone IFA 2018 के मंच से पेश हुआ था जो कई Markets में Sale के लिए available हो चुका है। MOTOROLA One Power को पेश करने के साथ ही company ने यह घोषणा भी कि थी MOTOROLA One Power जल्द ही Indian market में भी लाया जाएगा। वहीं Today MOTOROLA India ने इस Phone के Launch की official घोषणा कर दी है। MOTOROLA One Power इस 24 September को Will be launched in India. MOTOROLA One Power Mattel Unibody Design पर बना है। Phone को 19: 9 Bezal Lace Display with Aspect Ratio पर पेश किया गया है जिसमें उपर की ओर Notch दी गई है। MOTOROLA One Power 1520 x 720 6.2-inch FullHD + Display Support with Aspect Ratio करता है। यह Phone फिलहाल ANDROID Orio पर पेश हुआ है जो ANDROID वन होने के चलते जल्द ही ANDROID के Latest os ANDROID Will update on the pie । Adreno 509 GPU for graphics in the phone दियाा गया है तथा यह Qualcomm runs on snapdragon 636 chipset. 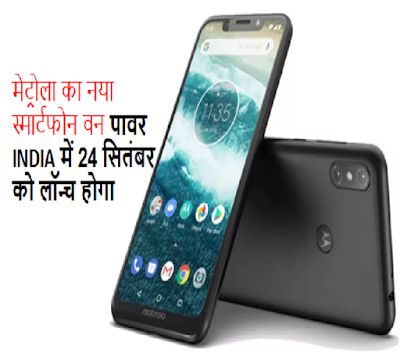 MOTOROLA ने International market में One Power को Launched in two variants जिनमें 64GB of internal storage with 32 GB storage and 4 GB RAM with 3 GB RAM is provided. Photography segments की बात करें तो Phone के Back panel पर जहां 16-megapixel and 5-megapixel rear camera sensors are given. वहीं Selfie के लिए Phone में 8-megapixel front camera दिया गया है। Phone back panel पर ही MOTO का LOGO लगा है जो Fingerprint sensor is embedded.